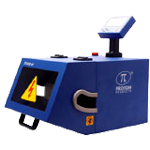 Provide high-speed, non-contact, optical diameter measurement. Are available in different diameter and speed ranges to suit applications and budgets as required. UL1581-compliant high-frequency spark testing for high line speeds. 25mm maximum cable or wire diameter. 100mm long bead chain electrode. Distinguishes between pinhole and bare patch flaws. 2.1 to 4.5kHz sine wave test frequency (load dependent). 2000 to 3000 m/min line speed (test frequency dependent). Suitable for automotive, instrument, power and telecommunications cables.